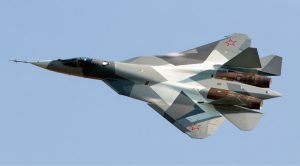 The Perspektivnyi Aviatsionnyi Kompleks Frontovoi Aviatsyi T-50 is the full name of this fifth generation stealth fighter. 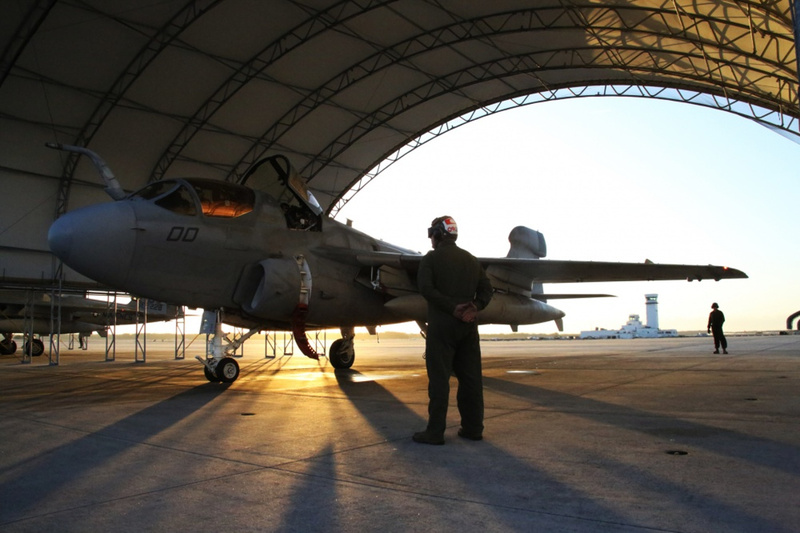 It first officially hit the skies in 2010 with a focus on air superiority missions. 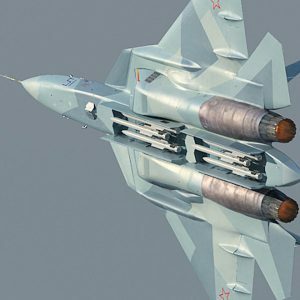 The Sukhoi PAK FA T-50 is roughly the same size as a US F-35 Lightning II, but it’s believed to handle better than an F-22 Raptor. 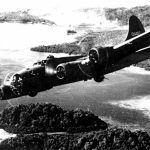 It can takeoff with up to 20 tons and uses an active electronically scanned array radar system (AESA) to assist in stealth. 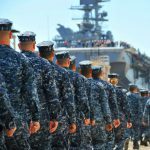 The system it employs is similar in capabilities to the new generation of F-16’s and comparable to the United States’ newest fifth generation stealth multirole fighters. The T-50 is also believed to be able to sustain up to 9 g’s — that’s nine times the force of gravity, similar to the F-16 Fighting Falcon. Since its first release on the 29th of January in 2010, countries across the world have been keeping their eyes on a fighter jet that is capable of carrying a cruise missile. An F-15 Strike Eagle is another example of a twin-engine aircraft capable of transporting an exceptionally heavy ordinance load but the similarities begin and end there with the T-50. 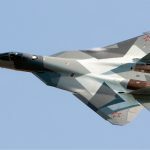 Because the Russians are not as forthcoming with releasing specific details of one of their next generation stealth fighters, private aerospace experts have observed features of the aircraft which have helped in identifying key characteristics. One of which is its ability to carry up to six air-to-air missiles, making it exceptionally dangerous in interdiction missions. With a top sustained speed of Mach 2 and an optimal ferry distance of 3,420 miles, it promises to be a fighter capable of quickly getting into the battle space and sustaining operations while in theater. One of the unique features introduced into the T-50 is its shortened take-off distance of 1,080 feet and its hybridized wing-body design style called a “centroplane”. 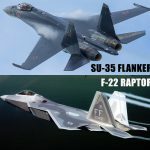 In many ways, the engine design borrows a lot from prior generations of Sukhoi fighters such as the Su-27 but also from American-made designs in the F-22. 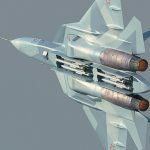 For instance, the T-50 uses a thrust-vector control (TVC) similar to the F-22 but with notable improvements towards recovering the aircraft in the case of recovery from a stall. With a projected thrust-to-weight ratio of 10:1, the T-50 shows promising signs for tight maneuvering in air-to-air battles. 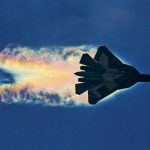 It has yet to be formally tested in an actual conflict but initial reports from flight data suggest this aircraft is more than a match for current fifth generation F-22’s coming off the assembly line. Because it shares so many characteristics with both jet aircraft from the United States and previous Sukhoi fighter aircraft, the T-50 presents a unique set of capabilities for mission planners. It meets all the requirements for both a stealth jet fighter as well as being able to handle short runways and long flying times. 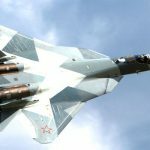 Aviation experts claim that the T-50 can aerodynamically outperform the F-22 Raptor. 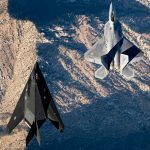 This may nullify the effect that fifth generation stealth fighters hoped to introduce into strategic planning — until they’re formally tested against each other. The T-50 operated with twin Saturn izdeliye 117 (AL-41F1) in its initial production run but Sukhoi has implemented a more advanced izdeliye 30 for later runs. These engines incorporate a thrust vectoring turbofan that produce up to 21,000 pounds of force each.